The energy has been very high here at Digital PTO all day. 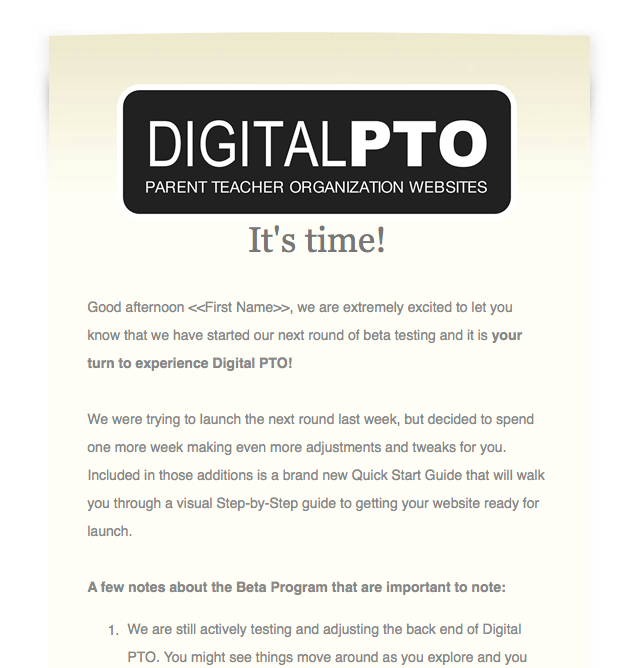 Less than an hour ago, we released the Digital PTO Beta Program and clicked the “send” button on all of the invitations that have been promised over the last few months. 2 years of research and work and today the first public eyes are going to be taking it in. All of us were secretly wondering, “How long is it going to take until a PTA signs up?” – our answer came about 30 seconds later. And again 60 seconds after that. Cool. We still have a long way to go before our Public Launch on April 6th, but today marks a giant leap in our milestones and we celebrate with a toast to our new beta testing family. Enjoy Digital PTO. «Going to ‘PTO Today’ Houston? Stop by to enter to WIN!